The number of developing countries with policies in place to support renewable energy has increased six-fold in just eight years, resulting in one-fifth of the world’s power production now coming from renewable sources, according to a United Nations-backed report produced ahead of the UN Sustainable Energy for All Forum. In the beginning of this year, 95 developing countries had renewables support policies in place – up from just 15 in 2005, reported the Renewable Energy Policy Network for the 21st Century (REN21), whose secretariat is supported by the UN Environment Programme (UNEP). “Markets, manufacturing, and investment expanded further across the developing world, clearly illustrating that renewables are no longer dependent upon a small handful of countries,” states REN21’s Renewables 2014 Global Status Report. The report credits such support policies with driving global renewable energy capacity to a new record level last year – more than 1,560 gigawatts, up more than 8 per cent from 2012. Overall, 144 countries have renewable energy support policies and targets in place. The report will be formally launched at the first annual Sustainable Energy for All Forum, a three-day event which will kick of tomorrow at UN Headquarters in New York and brings together leaders of government, business and civil society to assess progress on sustainable energy, showcase innovation, present new commitments and spur further action. The forum will also add momentum towards the UN climate summit in September, and advance the dialogue on how energy issues should be reflected in the post-2015 development agenda. Launched in 2011, the UN Sustainable Energy for All initiative aims to accomplish three objectives by 2030: ensuring universal access to modern energy services; doubling the global rate of improvement in energy efficiency; and doubling the share of renewable energy in the global energy mix. “Global perceptions of renewable energy have shifted considerably,” said Arthouros Zervos, Chair of REN21. Overall, renewables account for more than 56 per cent of net additions to global power capacity in 2013, according to the figures cited in the latest report. China, the United States, Brazil, Canada, and Germany remained the top countries for total installed renewable power capacity. 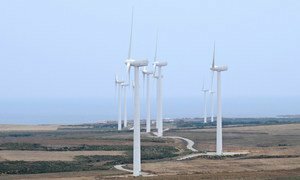 Meanwhile, China’s new renewable power capacity surpassed new fossil fuel and nuclear capacity for the first time, the authors found. In the European Union, renewables in 2012 represent the majority of new electricity generated capacity, in contrast with conventional fossil generation that accounted for 80 per cent of new capacity. “The past decade has set the wheels in motion for a global transition to renewables, but a concerted and sustained effort is needed to achieve it. With increasingly ambitious targets and innovative policies, renewables can continue to surpass expectations and create a clean energy future,” said Christine Lins, Executive Secretary of REN21. The United Nations launched to the business community today the Decade of Sustainable Energy for All (2014-2024), an initiative aimed at promoting renewable energy and energy efficiency worldwide, with a forum to take place annually, starting this coming June.